In the early nineties all over the country, including Arizona, people watched the news on edge as the historic O.J. Simpson case played out. Last month the infamous defense attorney who worked on the high profile O.J. Simpson murder case, F. Lee Bailey, made the motion to file for bankruptcy in the state of Maine. He is working with bankruptcy lawyers to discharge his IRS debt of over five million dollars. Our culture’s renewed interest in the O.J. Simpson case, which is evident in current TV shows and documentaries, is putting a spotlight on a lawyer that one would assume would be forgot so long after his pinnacle trial. But how could such a successful attorney be facing bankruptcy? Bankruptcy is the legal process of eliminating one’s debts when their assets and income greatly differ and they cannot pay off their debts. Businesses and individual people can apply for different types of bankruptcy. One must account for all their assets and a court will decide if they can apply for bankruptcy. Who is F. Lee Bailey? Bailey is a former American attorney that handled many high profile cases. For the bulk of his career, he was licensed in the states of Massechusetts and Florida. His expertise was in the field of criminal defense. Outside of his more public cases, he also served as the supervisory attorney over lawyer Mark J. Kadish for the court marrtial of Captain Ernest Medina for the My Lai Massacre. After his accumulation of defeats, legal controversies, and trouble with the law, Bailey was disbarred in both Massachusetts and Florida, meaning he was no longer allowed to practice law in those states. This came about after his reported misconduct while defending Claude DuBoc, an accused marijuana dealer. This misconduct was Bailey’s attempt to take stock assetts that DuBoc agreed to pay the US goverment, because he felt he was entitled to as payment for his legal fees. His use of the stock as collateral for loans led him to being imprisoned for contempt for forty four days until his family was able to raise the money to return the stock to the government. Bailey was one of several lawyers that defended Simpson, a former NFL player, in his 1995 notorious trial for the murder of his ex wife Nicole Brown Simpson and friend Ronald Goldman. Bailey was no stranger to high profile cases. In the sixties, the attorney successfully reversed Dr. Sam Sheppard’s murder conviction and successfully acquitted him for the murder of his pregnant wife in his second trial. Bailey also defended Albert DeSalvo, a man who claimed to be the infamous Boston Strangler. IRS debts, due to their tax related nature, are often not eligible debts that can be erased by filing for bankruptcy. F. Lee Bailey claimed that his proceedings should be successful if he can prove that he has abided by specific conditions. One may be able to file for bankruptcy due to IRS debts if they can prove that they have been properly paying their taaxes since the original penalties were recieved. Bailey’s debt is from an income dispute between 1993 to 2001. Bailey was disbarred in the early 2000’s over the midhandling of a client’s assets. The state of Massachusetts put up a reciprocal dibarment several years later. Bailey attempted to get admission to Maine’s bar and failed in 2014. The Maine Supreme Court reversed a ruling from a judge that would have given him access to practice law in the state. Bailey has stated that he wishes to completely discharge his IRS debts and puts the reasoning on his old age, claiming that at eight three years old, “it’s a little late to raise that kind of money overnight.” Bailey’s ultimate fate in his bankruptcy hearing isn’t too easy to predict. 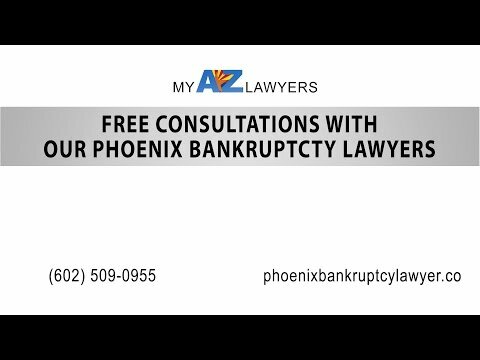 Where can I find a great Arizona based bankruptcy lawyer? My AZ Lawyers can match you with an experienced bankruptcy lawyer in Arizona. If you plan to file for bankruptcy in Arizona, you probably already know that it isn’t the easiest task. Luckily, My AZ Lawyers can give you a consultation and pair you with a bankruptcy lawyer that will fight for you and help you properly and accurately gather your assets to file for bankruptcy in Arizona. Give us a call today to learn more about how we can help you.